The FogKicker Water Sports Bottle contains 4.5 mL of the patent-pending FogKicker Water Sports Formula, for use on scuba & snorkel masks and swimming goggles. 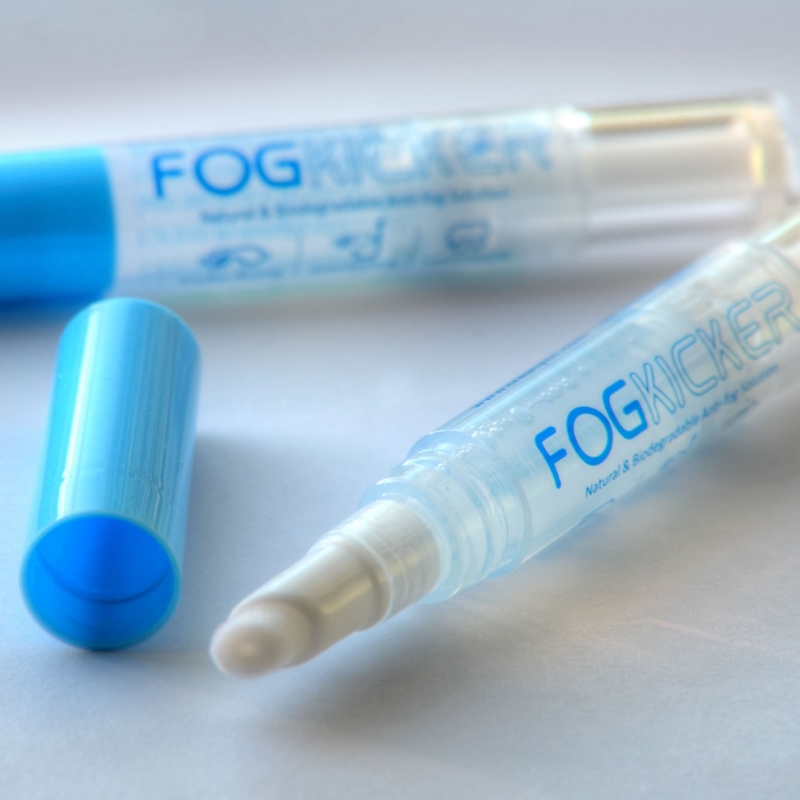 A single coating of FogKicker can prevent fog up to a month. The FogKicker Water Sports Formula is water resistant; it won&apos;t rinse off in the water and keeps preventing fog dive after dive, swim after swim. The FogKicker Water Sports bottle works like a marker. FogKicker coats on clear and dries in minutes. Directions for use are the following: 1. Clean lenses with wet cloth before applying 2. Remove cap, twist bottom to release formula into marker tip 3. Brush a thin coating over the entire surface of lenses 4. Set mask or goggles down on a flat surface and allow coating to thoroughly dry for 15-20 minutes before use 5. To re-apply, simply clean lenses with wet cloth and repeat steps 2-4. Full directions are printed on the bottle. Each bottle contains approximately 10 coatings for a dive mask and 15-20 coatings for swimming goggles. FogKicker Winter Sports Formula for use on goggles, helmet visors, and glasses also available.